New York City or simply New York, is the most populous city in the United States. New York City has many popular tourist destinations including Times Square, the Empire State Building, the Statue of Liberty, Central Park, Rockefeller Center, and Broadway. With an estimated 2016 population of 8,537,673 distributed over a land area of about 784 square kilometers (302.6 square miles), New York City is also the most densely populated major city in the United States. New York City is one of the most popular film and television production settings in the world. 1/3 of the indie films produced in the U.S. are filmed in NYC. Music, art, fashion, and publishing are all major industries in NYC as well. A global power city, New York City has been described as the cultural, financial, and media capital of the world. New York City is situated in the Northeastern United States, in southeastern New York State, approximately halfway between Washington, D.C. and Boston. The geography of New York City is characterized by its coastal position at the meeting of the Hudson River and the Atlantic Ocean in one of the world’s largest natural harbors. Most of New York City is built on the three islands of Long Island, Manhattan, and Staten Island. The highest point in the city is Todt Hill on Staten Island, which, at 124.9 meters (409.8 feet) above sea level, is the highest point on the Eastern Seaboard south of Maine. New York is composed of five boroughs: Manhattan, Brooklyn, Queens, the Bronx and Staten Island; each of which is a separate county of New York State. Wall Street, which is headquarters of the U.S. financial industry, is located in New York City. The written history of New York City began with the first European explorer Giovanni da Verrazzano in 1524. A permanent European presence in New Netherland began in 1624 – making New York the 12th oldest continuously occupied European-established settlement in the continental United States – with the founding of a Dutch fur trading settlement on Governors Island. In 1664, the city was named after then Duke of York, and future King of England James II. Charles II, King of England, James’s older brother, had named him proprietor of the former territory of New Netherlands and its main city of New Amsterdam, which had recently been seized from the Dutch. The Battle of Long Island, the largest battle of the American Revolutionary War, was fought in August 1776 within the modern-day borough of Brooklyn. In 1789, New York City became the first national capital of the United States for a year. 7,000 acres in the Bronx is designated as parks and open space. New York Botanical Gardens, the Bronx Zoo, Van Cortland Park and Pelham Bay Park are all included in this area. In the 19th century, the city was transformed by development relating to its status as a trading center, as well as by European immigration. NYC is home to Central Park, which covers 883 acres in Manhattan. Other major parks in NYC include Prospect Park in Brooklyn (90 acres), Flushing Meadows-Corona Park in Queens, and the Conference House Park on Staten Island. The Big Apple moniker first gained popularity in connection with horseracing. Around 1920, New York City newspaper reporter John Fitz Gerald, whose beat was the track, heard African-American stable hands in New Orleans say they were going to “the big apple,” a reference to New York City, whose race tracks were considered big-time venues. Fitz Gerald soon began making mention of the Big Apple in his newspaper columns. In the 1930s, jazz musicians adopted the term to indicate New York City was home to big-league music clubs. The nickname later faded from use and wasn’t revived until the early 1970s, as part of a tourism campaign to spiff up New York’s image. The original Penn Station was torn down despite being considered one of the world's most beautiful train stations. Time Square is one of the most well-recognized spots in New York City. It is a major commercial intersection, tourist destination, entertainment center and neighborhood in the Midtown Manhattan. Brightly adorned with billboards and advertisements, Times Square is sometimes referred to as “The Crossroads of the World”, “The Center of the Universe”, “the heart of The Great White Way”, and the “heart of the world”. Times Square is one of the world’s most visited tourist attractions, drawing an estimated 50 million visitors annually. Hudson River was named after Henry Hudson, who sailed the river in 1609. The Statue of Liberty is another iconic landmark. It is a colossal neoclassical sculpture on Liberty Island in New York Harbor. The copper statue, a gift from the people of France to the people of the United States, was designed by French sculptor Frédéric Auguste Bartholdi and built by Gustave Eiffel. The statue was dedicated on October 28, 1886. George Washington was inaugurated in NYC's old City Hall following the end of the Revolutionary War. The Empire State Building is an iconic 102-story skyscraper in Midtown Manhattan. It was the tallest building in the world from 1931 to 1972. The building has a roof height of 381 meters (1,250 feet), and with its antenna spire included, it stands a total of 443 meters (1,454 feet) high. The Empire State Building is in the Art Deco style, characterized by decorative, geometric designs. NYC's boroughs are also counties. Manhattan is New York County; Brooklyn is Kings County; the Bronx is Bronx County; Queens is Queens County; and Staten Island is Richmond County. New York City's subway system is one of the largest systems worldwide. There are roughly 469 subway stations in operation. One World Trade Center also known as the Freedom Tower is the main building of the rebuilt World Trade Center complex in Lower Manhattan. The supertall structure has the same name as the North Tower of the original World Trade Center, which was completely destroyed in the terrorist attacks of September 11, 2001. At 541 meters (1,776 feet), One World Trade Center is the tallest building in the Western Hemisphere, and the sixth-tallest in the world. New York City is a major tourist destination, attracting as many as 56 million people a year. Public-minded members of the contemporaneous business elite lobbied for the establishment of Central Park, which in 1857 became the first landscaped park in an American city. It was later improved and expanded according to Frederick Law Olmsted and Calvert Vaux’s Greensward Plan, after which it was reopened in 1873. Central Park is comprised of 341 hectares (843 acres). It is 4 kilometers (2.5 miles) long and 0.8 kilometers (0.5 mile) wide. Central Park receives around 42 million visitors annually and stays open all year. New York City has a large number of universities and colleges including Columbia University, and Rockefeller University. The most breathtaking view of the city is from its marvelous bridges. They all are, without any exceptions, pieces of art. The city is home to more than 2,000 bridges and tunnels. Probably the most famous is the Brooklyn Bridge. It is is a hybrid cable-stayed/suspension bridge and is one of the oldest bridges of either type in the United States. One of the first acts of terrorism in the U.S. occurred in 1920 when a horse-drawn carriage exploded on Wall Street. 30 people were killed and the criminals were never caught. Another landmark of New York is yellow taxi. More than 13,000 licensed taxis work in the city. In case you don’t have cash, you can easily pay by credit card, and I consider this as one of the most convenient things in the city. There was once a pneumatic mail system in NYC. It connected 23 post offices and moved 97,000 letters across the 27 mile tube system each day. New York is full of experiences and is one of the best places in the world to try incredible food. So many different people live here and they are all happy to offer their national cuisine. Some people consider the city one of the best places to try famous NYC pizza. Many of the restaurants rank among the most expensive in the world while the others are ready to offer you the fast food for a couple of dollars. Toilet paper was invented in NC in 1857. New York City subway was opened in 1904 and nowadays it represents the largest mass transit system in the world with 472 stations. Approximately 6 million people use the subway every day. New York City has more than 2,000 arts and cultural organizations and more than 500 art galleries of all sizes. Broadway theatre is one of the premier forms of English-language theatre in the world, named after Broadway, the major thoroughfare that crosses Times Square. Each New Year’s Eve 1 million people gather in New York City’s Times Square to watch famous ball drop. Another 1 billion people from around the world will watch the famed ball drop on TV. New York City's first pizzeria opened in 1895. It was also the first in the United States. 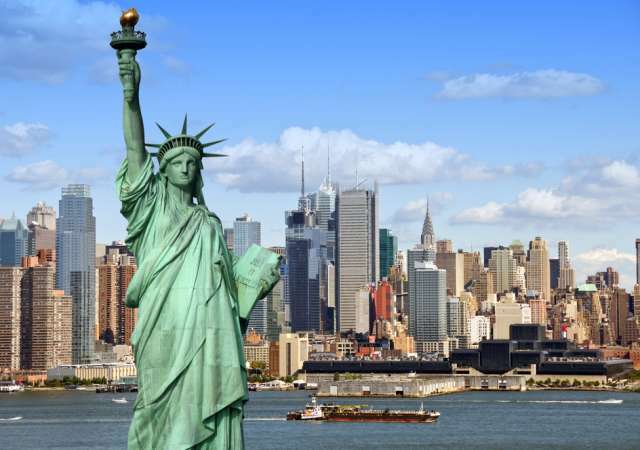 New York City receives over 60 million foreign and American tourists each year. Among celebrities that were born in New York City are: Al Pacino, Eddie Murphy, Sylvester Stallone, Ben Stiller, Liv Tyler, Anna Hathaway, Robert Downey Jr., Christina Aguilera, Jay Z, Adam Sandler, Jennifer Lopez, Donald Trump and Lady Gaga. Land in New York is priceless to own and even more expensive to develop that people are looking up — way up. In New York City, it’s possible to sell the air above a building for future development. Air, people. Air! New York invented one of the world’s first and greatest luxury hotels — the Waldorf Astoria — which invented the velvet rope and its meaning. Manhattan comes from a word in the Lenape language that means “Island of many hills”. The city and its metropolitan area constitute the premier gateway for legal immigration to the United States, and as many as 800 languages are spoken in New York, making it the most linguistically diverse city in the world. New York City has the largest Chinese population of any city outside Asia and the largest Puerto Rican population of any city in the world. New Yorkers drink almost 7 times more coffee than other cities in the U.S.
All underground subway stations in New York City have Wi-Fi connectivity.